It's overwhelming. My grandmom's house was never this happening. How I wish my Pak Lang is still alive to experience such an event. Small election? It's big actually! During the main elections, everyone was busy working for their own area but for this small election, the whole country came over to ensure their winning. It was like a bless for the Machap area where everything changed, even though it seems or looks like hypocrit, it is a gift from god that all of the villagers were thankful for what they've got now. The best thing is, most of the volunteers that stayed in my granma house are girls, and some of them are cute too. Hehe. So that made me feel a lil awkward in my own granma house. So the preparation for the campaign and work for the election has been organized very much earlier. I do respect the villagers. They work for the party they are electing without having the idea of taking the advantage from what they are doing. I could see most of them (especially my auntie whose the Ketua Wanita kampung) work sincerely, without craving for anything in return. What about those urban people? All they have are complains. Not to mention to work for the party, they may not even vote in the election. Yet they think they deserved a lot of things. Hehe. So last night was the peak of the campaign as tomorrow is the election day. There were a lot of top politicians/celebrities came over, give their talk and eat my granma's cooking. Those include Dato' Najib, Dato' Ali Rustam, Jins Shamsuddin, Khir Toyo(l), and Datuk Shapie Apdal. Dato' Najib even complimented on my granma's cooking. The only lacking thing was me. I was not around to translate those eye to eye meetups into something u guys can consume. 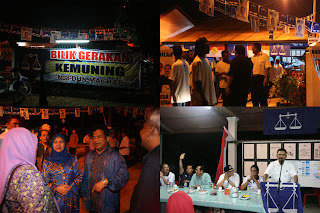 Well, to give my support to that BN government that I always criticize, I decided to drive up to Melaka to join in the event and to take pictures! As I arrived, I was told that Dato' Azmi Khalid and his pretty wife, Normala Samsudin is coming. Wah. I was imagining me taking pictures of Normala, someone I adored so much just for her beauty, but as it was about to eve, Dato' Yaacob came and informed us that Dato' Hishamuddin, the Youth Wing Leader of UMNO and the Education Minister is coming. That's more refreshing, especially to the tired me! Better, Khairy Jamaluddin is coming too! Well, these two figures is sitting on 2 most wanted position by the newcomers. Hishamuddin is definitely a fine speaker. I'm not oing to comment on his speech but all I would say is that he is way motivating! 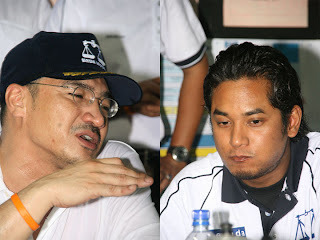 Before they leave, I asked Dato's Hishamuddin permission to take picture of him and Khairy with my Auntie. Oh yeah, my auntie is the one with the pink tudung. 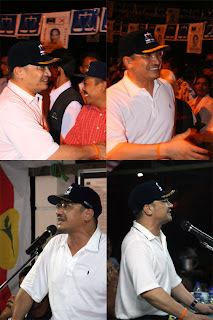 And if u wanna know, i did called Hishamuddin as abang just now. Hehehe. Silap. So with Khairy Jamaluddin. Hehe. Sensasi Selebriti :: First meet-up.